In the Book of Numbers, the Torah relates how the Jews were attacked by the nations that lived on the east bank of the Jordan River. The Jews fought back, and after winning the war, they were left with a vast tract of land outside the originally-intended borders of Israel. This land was good grazing land. Two of the twelve tribes, Reuben and Gad, owned a large number of sheep. 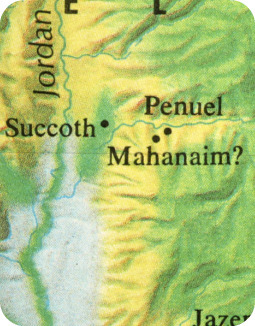 They decided to settle on the east bank of the Jordan rather than continue on to Israel's mainland with the other Jews. Moses was angry. He argued that the other Jews would infer that the real reason that Reuben and Gad would not continue onto Israel was because they were frightened of being killed by the powerful Canaanites. That fear would spread, and soon all the Jews would panic and refuse to settle in Israel. Reuben and Gad promised to join the other Jews on their journey into IsraelIn order to alleviate that concern, Reuben and Gad promised to join the other Jews on their journey into Israel, and, in fact, to lead the Jewish army in conquering the land. Only after the other Jews were securely settled would Reuben and Gad return to their land on the east bank. Moses accepted their pledge, and he gave the land east of the Jordan to Reuben and Gad. He also awarded a part of that land to a portion of the tribe of Menasseh—even though they had never asked for it! This is a peculiar thing. If Moses was upset with Reuben and Gad because he considered it wrong for Jews to settle outside of Israel proper, why would he then thrust the land on the family of Menasseh? But in truth, Moses was not upset at Reuben and Gad for choosing to settle on the east bank; he was only concerned that the other Jews would interpret their decision as a lack of courage and that fright might spread. Once that issue was resolved, Moses was no longer concerned. In fact, there was actually a very noble and idealistic reason to settle the east bank. The Torah tells us that the Land of Israel was meant to expand with time to include the surrounding lands. Eventually, Israel expanded all the way up to the Euphrates. And in the era of the Messiah, the holiness of the Land of Israel will encompass the entire earth! When our Sages say that the borders of Israel will expand, the intention is not for material gain. Rather, the purpose is that the spiritual values that Israel embodies will eventually inspire people around the world. Israel was intended to be a country where Jews can take the noble ideas about life contained in the Torah and translate them into real life. It is a tough challenge to introduce the world to the value system of Judaism, because our goals are so divergent. The world's motto is "Time is money"; a Jew lives by the motto "Time is (an opportunity to do) mitzvot." Reuben and Gad made a first stride in spreading the holiness of Israel to the outside by converting the east bank of the Jordan River into part of the Holy Land. It is up to us to continue that job. If we will be model human beings and good Jews, we too will spread "the mindset of Israel" and be an inspiration to the entire world. Rabbi Avrohom Altein serves as the senior rabbi of the Ashkenazi Congregation and of two Lubavitch synagogues of Winnipeg. He is the director of Chabad-Lubavitch institutions of Winnipeg, Manitoba, where he resides with his wife, Brocha. Does My French Home Legally Assume Land of Israel Status?